The problem with this is that the Nimbus set of fonts renders really badly (on my machine at least). The fonts appear with blue pixels to the right of about 50% of letters. Can these be changed to map to DejaVu or Bitstream fonts instead? DejaVu and Bitstream map beautifully. I'll attach screenshots of these current fonts in action. This is a screenshot of the problem. I've also zoomed a section of the screenshot so that it is easier to see. Please note that this is on an lcd monitor.. so there is sub-pixel anti-aliasing turned on..
A patch to change the fonts over to the DejaVu set. That's sub-pixel antialising for you. A bit of an odd way to antialias (with the blue), admittedly, but that seems to be what you get. by default, the font configuration is set to "Best Shapes" although I'm on a laptop (is it a bug ?) 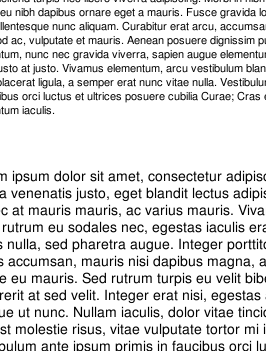 and the Nimbus Roman font is crippled with blue pixels (exactly like on the picture reported). Then, I selected "Subpixel Smoothing", restarted Abiword and OpenOffice, and noticed that the blue pixels were no longer there. Sorry guys.. I had *assumed* that sub-pixel antialiasing was on. It was not. After turning it on, firefox and openoffice both render nimbus much more nicely. However! Epiphany still does not 8-| how weird is that! May need to file a bug report against epiphany also..
definitely not. Nimbus is the best free font for printing, so it should stay the default for applications like OOo. Our default font DejaVu is metric incompatible with fonts like Times, Helvetica, Arial, Verdana, Times Roman, so every time one of these fonts is missing (i.e. in the default installation), we have to have a fallback font, which displays accurately. If you know of a better metric choice, please propose one. DejaVu and Bitstream Vera are not. I suppose my main problem is that it doesn't seem to fall back to nimbus - but it chooses it by default. If I install the MS web fonts, I would prefer to display Timed New Roman instead of Nimbus (I chose to install the MS fonts so I'm not opposed to non-free). > definitely not. Nimbus is the best free font > for printing, so it should stay the default for > applications like OOo. Then, as I said, the font configuration should be set to "Subpixel Smoothing" automatically when a laptop is detected. Without it, Nimbus is really ugly on laptops. Why does Times remap to Nimbus even when Times New Roman is installed? This is causing major problems with formatting in OpenOffice because the sizing is apparently different. I am marking this as hardy targeted since something needs to be done before release. Apparently the liberation fonts are supposed to be perfect matches but they are in multiverse for some reason. I haven't looked into why yet but they are supposedly GPL'd fonts. 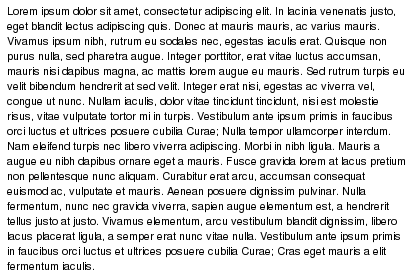 I'm sorry for the seemingly conflicting opinion on whether Nimbus should be the remapped font for Times on OOo, it appears that since Matthias said that a couple years ago that using that substitution is actually a bad idea due to page layout reasons which have shown up after the change. There is also a bug in that OOo shouldn't be defaulting to using 'Times' as a font since there is no 'Times' font installed which has caused this issue to become a much bigger issue since if a user creates a document with 'Times' on Ubuntu with the Nimbus substitution and then tries to move it to some other system it will not layout the same due to incorrect(?) metrics of Nimbus. I saw another Bug 109256 which mentioned that the oo-welcome.odt grew in size between 6.10 and 7.04 and after looking at it uses Nimbus Roman No9 L as the main font. After changing it to Times New Roman (using non-free fonts) it went back to the size it should be (2 pages instead of 3). So did Nimbus Roman No9 L change metrics (or whatever?) since Ubuntu 6.10? Unless something weird is happening in OpenOffice it would seem that would be the most likely cause of both issues. This bug report was originally about a rendering issue with the Nimbus fonts (an issue which I think has been resolved); it would have been less confusing to open a new report for the mapping question. According to /etc/fonts/conf.d/30-metric-aliases.conf, the preferred mapping for Times is Nimbus Roman No9 L, and only if it's unavailable is a fallback to Times New Roman used. This makes sense to me, as Times and Times New Roman are not the same font. I'm not sure why you're expecting Times to map to Times New Roman instead of to Nimbus? The Liberation fonts are also not given preference over Nimbus for the "Times" family, only for the "Times New Roman" family. This seems consistent to me. > will not layout the same due to incorrect(?) metrics of Nimbus. What are these other systems using to implement "Times"? I'm not sure how this bug can be resolved, either in OpenOffice or in fontconfig. It looks to me like it's a bug in other systems for assuming Times == Times New Roman, and that they're metric-compatible. You could change the OOo package to default to Times New Roman instead of Times to address this assumption elsewhere, but it looks like we would still have the problem that we don't have any TNR fonts installed by default, so the resulting documents would still render differently on systems with TNR than on those without. Until/unless we can resolve that, I think the current behavior of both OOo and fontconfig is probably correct, since in that case the document is at least rendered correctly on the *author's* computer even if it's mis-rendered elsewhere. I have noticed the same problem with fonts rendering on my Asus F5N laptop regardless "Best shapes" (default) or subpixel dithering settings. It is especially noticeable in Terminal and OpenOffice, and gives real strain on my eyes. Reboot into 7.10, and the fonts are all smooth and beautiful. I wonder if its the new X server, nVidia driver or anything else, as blue pixels appear only for menu font, and not against white background, and I do not observe /etc/fonts/fonts.conf mappings described in the original post. And now how it looks in Hardy (with all updates installed). Notice the shadows that were not present in Gutsy. Also, there is no real subpixel dithering now (both screenshots are with "Subpixel smoothing" option turned on). Fonts are pure black, just blurred. I put correct DPI for my LCD panel for nVidia driver in /etc/X11/xorg.conf as I had to do in Gutsy but it did not help this time. Thanks, Keenan. Thought using gnome-terminal as an example was a bad idea. Actually, Open Office has exact same problem with all its fonts, both menu and within documents. 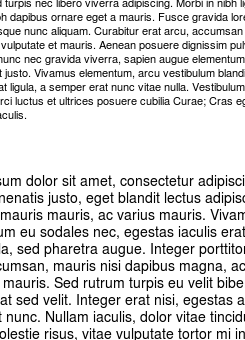 Firefox is also hit producing bad fonts on pages that use Arial, Tahoma and Courier New font-family style sheets. Wrong size for fonts to start with (1pt bigger than they should be). So what do you think is the root cause for the fonts not being rendered correctly? Ok, well if Times and Times New Roman are different sizes then there definitely is a bug somewhere else that maybe just looked like it was solved due to 'mismapping' of Times -> Nimbus. Sorry for the confusion, and yes there are other fontconfig related problems with OOo, maybe some of those will cause the apparent problem with sizing to be resolved. unmilestoning; based on last comment from Chris, this doesn't appear to be the bug that's causing problems for OpenOffice. I must admit that it was a bit of a shocker today upgrading to hardy and attempting to visit my favorite web sites (or not so favorite applications I have to work on) to discover that many of them were defaulting to this hideous unknown font if one was not explicitly set that the default hardy install likes. I don't even remember what the default font setup was like in feisty anymore because after installing whatever black magic is contained here - http://ubuntuforums.org/showthread.php?t=343670 - I never had to think about it again. Don't get me wrong, the fonts look ok enough but the differences between the default rendering here and that in os x/windows/etc is enough to make me seriously consider moving to a different platform for my dev box just to be on the safe side. (i've tried ms true type fonts on many occasions with many different distros and have never liked the results. the letter spacing is always wrong even if the the characters are rendered correctly individually) Thankfully my code editor was already using Bitstream Vera Sans which is still around so that part of my day hasn't been traumatized too much. Nevermind...I've discovered that through the wonderous powers of scp it is possible to simply copy over all fonts you would like to have available to your "~/.fonts" directory and run "fc-cache -fv ~/.fonts" to have your fontconfig update your cache configurations. Only fonts that you have purchased or are free of course, don't even think about scp'ing those macbook or windows *.ttf files over - because that wouldn't be legal - even if it does work. Has something changed here between Gutsy and Hardy? 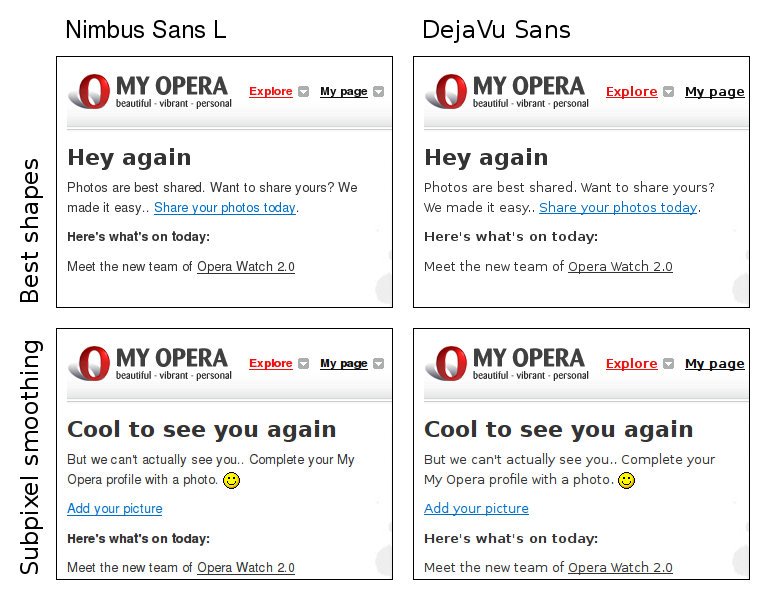 In Gutsy, I seemed to have all DejaVu fonts in Firefox. In Hardy, I'm getting the Nimbus fonts for the fonts mentioned (Times, Helvetica, Courier), which look pretty bad. Strangely, even if I copy my Gutsy /etc/fonts back over, it still wants to go to Nimbus (and yes, I cleared the cache, etc.). The only way I've found to get rid of the Nimbus fonts is to completely remove the /usr/share/fonts/type1/gsfonts directory. I don't know if it's truly correct and proper to use the DejaVu fonts here or not; all I know is the Nimbus ones look terrible on my screen. While the fonts with correct metrics might be the best option for OpenOffice & printing, they look much worse in small sizes on screen. See the attached image for comparison, both with and without subpixel smoothing. I believe DejaVu should be default, with possible exception of OpenOffice and other DTP applications. I've started a thread on the forums (http://ubuntuforums.org/showthread.php?t=804242) asking for a work-around for this problem. In particular, I'd like to set up the fonts on my system so that Nimbus is not displayed on screen (or, at the very least, in Firefox) unless it is explicitly asked for. If anybody subscribed to this bug has a solution, I'd love to hear it. The attached patch seems like a reasonable solution to me. Nimbus fonts should only be chosen if metric-compatibility with the Postscript fonts is required. Shouldn't you break the link between Arial and Helvetica instead? Those aren't metric compatible. And If someone requests a match for "Helvetica" it is likely that they expect a PostScript Type1 font. 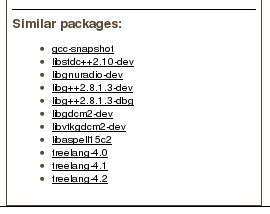 I've installed Intrepid about a month ago, and began populating my comp with packages outside of the Canonical repo. My personal preference goes to FreeSans and FreeSerif instead of the Nimbus fonts. So, after some searching here and there, I've found that if I add/edit a file in /etc/fonts/local.conf with entries similar to /etc/fonts/fonts.conf, I can replace (at least in OOo 2.4.1) the fonts not only in Writer (which is possible through OOo's Preferences menu) but also in other components. See appended local.conf. Oops, the Attach doesn't work too well... I'm pasting it here instead and hoping for the best. 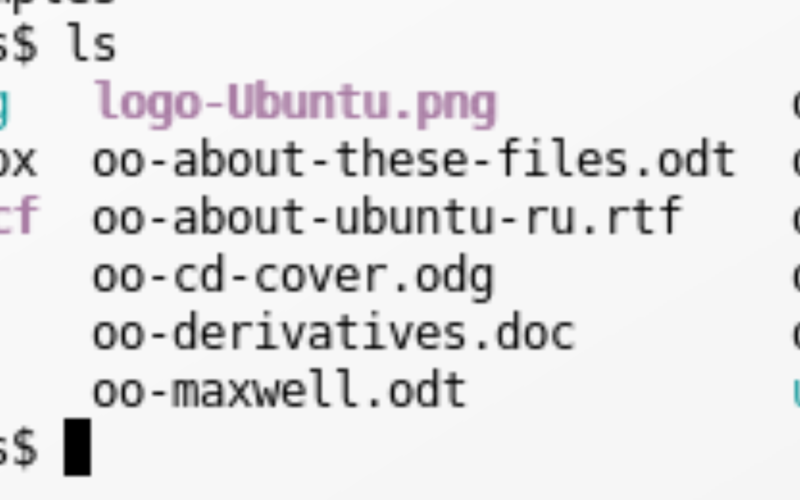 Edit the file with sudo gedit /etc/fonts/local.conf and wait about 30 seconds before trying with OOo. As always, Your Mileage May Vary but I hope this benefits/helps others. > Shouldn't you break the link between Arial and Helvetica instead? > Those aren't metric compatible. How far off is Arial from Helvetica? This wikipedia page says they have identical widths. > for "Helvetica" it is likely that they expect a PostScript Type1 font. I'll take Arial over Nimbus Sans L for screen rendering any day of the week, as (I suspect) would many other desktop users. Sadly, it took hours of reading, searching, trial and error to figure out how to make it happen. I doubt most users would have the patience; more likely they'd just live with the awful fonts and quietly blame Ubuntu for a job poorly done. May I ask why is this bug still unassigned? Isn't it necessary to move it to karmik where the situation is still the same? These Nimbus fonts are really anti-aesthetic (to my taste, no matter anti-aliased or not) and there is no clean way to uninstall them which I'd really prefer. Get rid of the Nimbus aliases. Please! These fonts are ugly, very ugly. This is how Nimbus Sans L looks like with font size = 11px in Firefox on Kubuntu. It is practically impossible to read websites that use Helvetica and a small font size. Is it really worth keeping those rules that map fonts to Nimbus? The attached patch removes the Nimbus mapping rules. 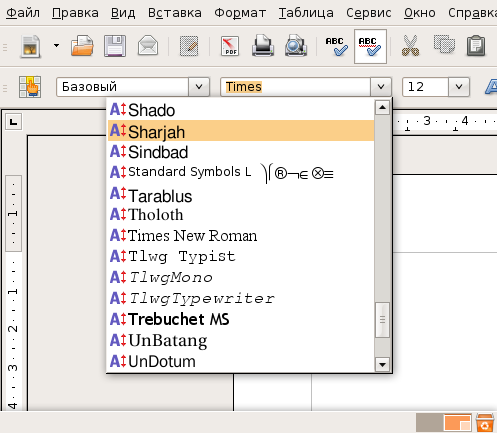 Here is another screenshot that shows packages.ubuntu.com which surprisingly prefers Microsoft fonts ("Verdana,arial,helvetica,sans-serif"). 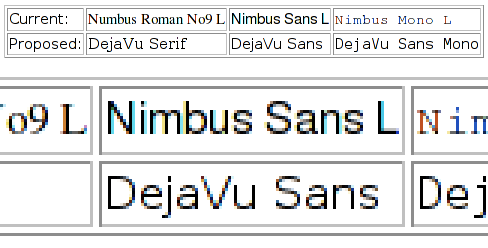 Verdana and arial aren't found on the system so helvetica is used which is mapped to Nimbus. Of course if Helvetica isn’t installed, it has to be mapped to Nimbus Sans, because Nimus Sans is a clone of Helvetica etc. Font rendering doesn’t seem to be well configured on your machine (respecitvely in the application from which you’ve taken the screenshot). Maybe the hinting is too strong. I attached a better-looking screenshot of Nimbus Sans in small size. The screenshots are from Firefox 3.6 on Kubuntu Lucid (both with default configuration). Nimbus renders very poorly on a small font size. Please take another screenshot with font size 11px. Firefox in Lucid has broken font rendering at the moment, so these screenshots are not suitable examples. I haven't noticed any font rendering issues in Firefox but in Konqueror Nimbus Sans L looks exactly the same. and one with light hinting. This is at least partially fixed by adding ttf-liberation to the ubuntu-netbook, kubuntu-desktop, kubuntu-netbook seeds, so that the Microsoft fonts will always have sane font substitution. @Forest: thx for the workaround, works perfectly! @Forest note on user level font.conf works around the Nimbus rendering issues. just run fc-cache -f -v to update the fontconfig cache afterwards and refresh your browser page. The trouble with this default aliasing to Nimbus is that for CSS authors who specify Helvetica as a first level font choice on their sites, any users with the default setup viewing the site will get Nimbus font rendering. The replacement of Helvetica with Nimbus fools Firefox into thinking that Helvetica is installed on the system. Comparing Helvetica on a Mac with 'Helvetica (Nimbus)' in FF/kUbuntu is no contest and there is no way that Nimbus is a valid replacement for Helvetica. Taking out the Helvetica rule in CSS using Firebug in FF3 and 4 will 'fix' the font as it will fallback to backup fonts like Arial or Verdana which are part of the MS font pack. 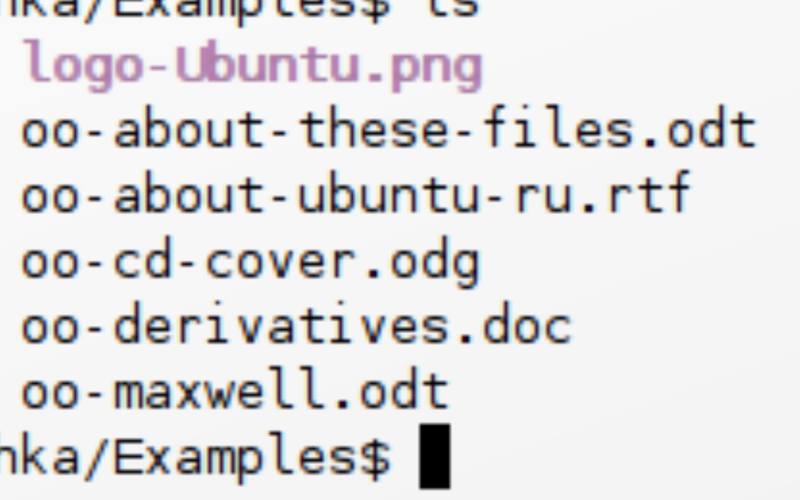 Thank you for reporting this bug to Ubuntu. Hardy reached EOL on May 9, 2013. I learned that the system was mapping Times and Helvetica to Nimbus equivalents, and that was messing up some websites. On-screen display of Nimbus fonts in Linux is not ideal, even if I disable hinting. They have a way to look awful. I changed the mappings to use Liberation fonts, and the result is much more harmonious text on websites. Nimbus can look really bad on small sizes.